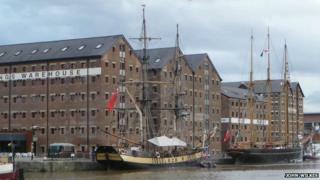 Boaters at Gloucester Docks are unhappy that dredging is being carried out to allow tall ships access so a Hollywood movie can be filmed. Work began on Monday and is due to last for three weeks, before filming of the movie, believed to be Through the Looking Glass, begins on 18 August. Concerned boaters said they were not given enough notice and the work would cause disruption on the waterway. The Canal and River Trust denied boat movements would be restricted. We're concerned about the lack of consultation. Martin Turner, chairman of the Gloucestershire and Herefordshire Branch of the Inland Waterways Association, said: "We have no objection to dredging as such, the issue is when it's being done and the lack of notice." He said it was a "serious issue" because the docks were busy with holidaymakers and usage restrictions were being put on locks linking them with the River Severn. "The boaters are paying their fees and can't use the facilities," he said. Mr Turner said many boaters had been given no warning because they did not have internet access. Nick Worthington from the Canal and River Trust, which looks after waterways, said: "This a fantastic opportunity to bring some wonderful ships into Gloucester Docks. "We're working with a third party filming company and we don't have control over their deadlines." He said timings had been agreed, and notification given two weeks ago. "In an ideal world we would have had more notice and would do the dredging out of the main boating season," he said. The lock would be open for three hours each day, allowing "three or four locks per hour" and "at least half a dozen boats per lock", he added.